Heat oven to 400°F (200°C). Spray bottom and side of 9-inch (23 cm) pie plate with non-stick cooking spray. Stir Bisquick* and butter until blended. Add boiling water; stir vigorously until soft dough forms. Press dough in bottom and up side of pie plate, forming edge on rim of plate. Sprinkle bacon, cheese and onions over crust. In medium bowl, beat cream, eggs, salt and cayenne pepper with spoon until blended. Pour into crust. Bake 30 to 35 minutes or until edge is golden brown and centre is set. Tip: Do-Ahead Tip: Cook and chop the bacon, shred the cheese and slice the onions the day before; store separately in refrigerator. Beat the cream mixture; store covered in refrigerator. 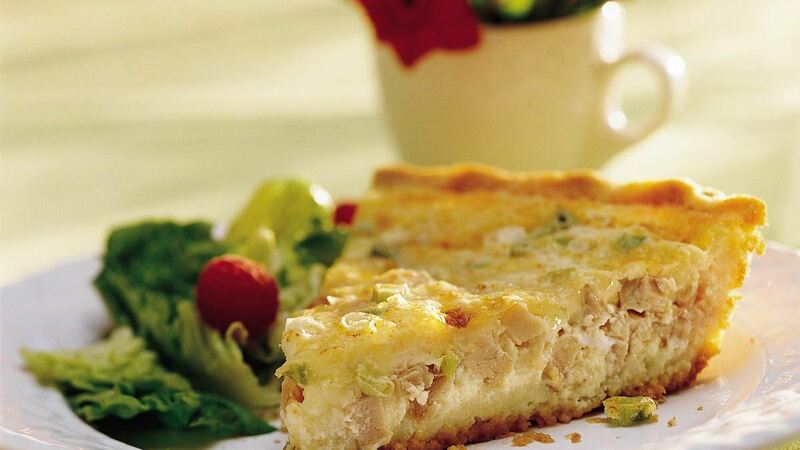 To serve, make the crust, assemble the quiche and bake as directed.